Maybe its a sunny day. Maybe somebody made your day sunnier. Either way, this arrangement will make any day a better one. 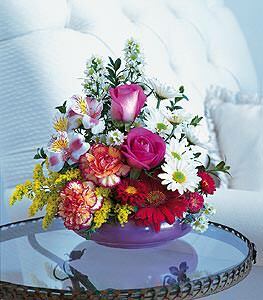 A pair of roses are nestled in the center and surrounded by a group of daisies, carnations and alstroemeria, and arrive in a matching bowl.